Tuesday morning the Team competed in both the acceleration and skidpad events at the same time. Both cars made use of the three hour time window and finished all runs. In the end, the results were great! Global Formula Racing’s cCar recorded the fastest skidpad time ever in a FSAE competition! While the combustion car team participated in the design finals in the afternoon, the eCar lined up for the AutoX event. Because the weather forecast predicted rain, every team wanted to do AutoX as soon as possible to start on a dry track. The first autocross drivers set competitive lap times allowing both cars to wait for better conditions before sending out the number two driver. During the first lap of the second driver’s run, the eCar suddenly broke down. GFR worried that it could be a devastating problem but the driver resolved the issue and said it could be fixed in a short time. Nevertheless our team members had to wait to tow the car back until all other cars had finished their runs. Meanwhile the cCar improved its time and set the overall quickest lap. As soon as the eCar team could step on the track, the car was pulled to the working spaced and the issue was fixed. Therefore the eCar began a new attempt and managed to beat its previous best by 2.6 seconds, which provided the team a good starting position in Endurance. Overall the eCar finished the Autocross in 4th place and the cCar took 1st. It was clear that both cars would have one of the last and best starting positions for Endurance. Concluding AutoX the team did the final checks and preparations for the 22km race on early Wednesday. In the background everything was prepared for the next race day so the team could relax and enjoy the presentation ceremony in the evening. For Endurance, Both the electric and combustion car had a smooth driver change and all drivers managed very good lap times. The cCar finished 1st, 40 seconds ahead of the next car. Although there were speed limits imposed to save the batteries, the eCar completed Endurance and still finished 3rd. As soon as the Endurance event was over it started to rain heavily! Before the presentation ceremony started at the campground, all participants were soaked and the ground was muddy. But not a single Formula Student participant let the rain ruin the party! The cCar had a dominant overall victory. Even more, the team was happy to be 1st place in the Business Presentation, 2nd place for Efficiency and 1st place at the Design event. The eCar could celebrate a 3rd place at Endurance and a 4th place at Autocross. Those two very good results and many other good results finally led to a 3rd place in the overall competition. With these results, the team was ecstatic. With great results and becoming good friends with many other Formula Student teams, we all celebrated late through the night. 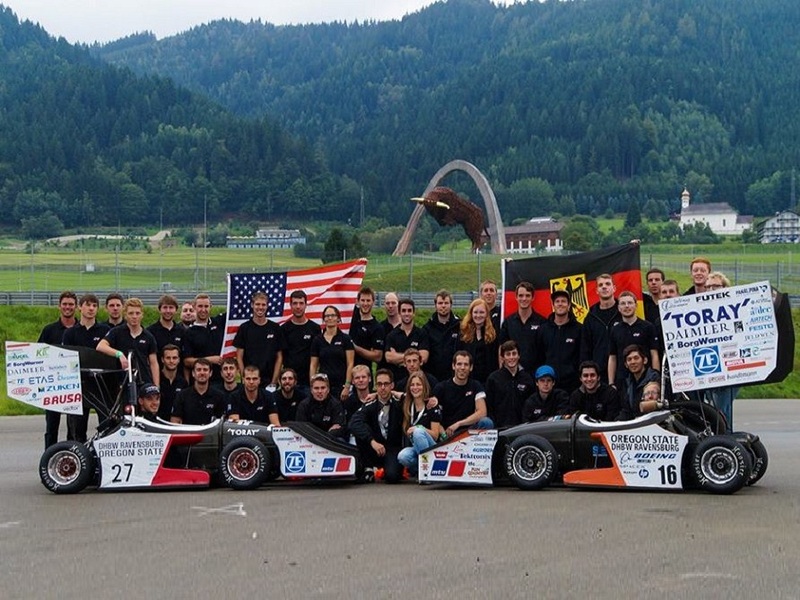 The eCar finished its season in Spielberg, while the cCar had another competition in Spain.